The 2000-2001 indoor and outdoor track and field seasons had strong performances from veterans and newcomers alike. Four school records fell during the two seasons. Abby Anthony '03 claimed the indoor 5,000-meter run record in the winter (17:19.24) then went on to destroy her own outdoor 10,000-meter by more than a minute (37:21.81). Liz Wanless '04 substantially improved the shot put record with her throw of 40' 11 1/2". Both veterans and newcomers came together to break the Distance Medley Relay record. Kelley Puglisi '03, Elizabeth Wallace '02, Julie Dutton '03 and Catherine Crosby '04 ran 12:52.13 breaking the previous record set in 2000. Anthony earned All-America honors in the 10,000 by placing sixth in the event at the NCAA Championships for the second year in a row. Anthony's Open New England title in the 10,000 was the first-ever under coach Court. Leigh Johnson '02 also excelled in the 10,000, earning All New England and All-ECAC Honors. Also earning All-New England honors were Anthony in the 5,000, Puglisi '03 in the 1,500, Margaret Herrick '03 in the 100-meter dash, Sarah Tressel '04 in the high jump, and Cami Wood '01 in the hammer. The Bobcats took home three Maine State championships in the winter season, as Anthony captured the 3,000 and 5,000, while Crosby took the 400. The talent laden class of '05 will have the opportunity to take advantage of the new eight-lane Mondo track that will be completed during the summer of 2001. The 2001-02 Bobcats, with the veterans and newcomers, should be the most talented in recent Bates history. Bates track traditionally has a large number of participants to provide both quality and depth in the many different events. Bates has been successful at the highest levels, with 14 athletes earning All-America honors and ten athletes taking home Eastern College Athletic Conference (ECAC) titles. The experienced four-person coaching staff allows opportunity for individualized instruction for every athlete in every event. Tremendous campus support is shown by the large number of spectators and the many volunteer officials from the Bates community in attendance at track and field meets. Bates track and field teams are respected by officials and competitors for their sportsmanship and outstanding team support. Throughout its history, Bates has been at the nation's forefront in supporting new events and new women's championships. Bates athletes successfully petitioned for the inclusion of the 20-pound weight and the hammer throw at the NCAA championships. Bates has had top performers in those events, boasting All-America performances in the hammer and ECAC championships in both the hammer and weight throw. Bates athletes and staff also were instrumental in the inclusion of the pole vault at national-level competitions. Shannon Walker '97 arrived at Bates with a best vault of 9' 0" and left with a personal record of 11' 3". The pole vault became a regular-season scoring event and an NCAA championship event for women after her graduation. 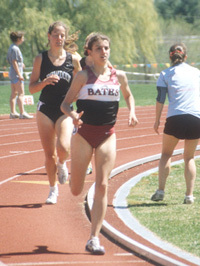 The first NCAA Division III indoor track and field championship was hosted by Bates in 1985, and the ECAC championships for both indoor and outdoor track were also organized by Bates coaches. Bates College track and field athletes train on the Walter Slovenski Indoor Track, one of the finest indoor facilities in the nation. Bates broke ground on an all-new outdoor facility over summer 2000. The eight-lane bi-radial track with 10-lane straightaways features a similar design to many European tracks. The Mondo polyurethane surface is the same used at the 2000 Sydney Olympics. The Davis Fitness Center provides a state-of-the-art strength training and conditioning venue for Bates athletes. Tarbell Pool is reserved one afternoon each week for non-impact training, and a trampoline is available for refining jumping and pole vault technique. 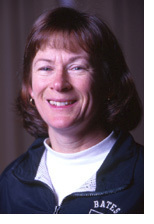 Carolyn Court ( ccourt@bates.edu ) serves as women's track and field and cross country coach. An All-American in the 800-meter run at Southern Connecticut State University and was inducted in the school's Sports Hall of Fame in 1997. She earned her master's degree at Penn State and came to Bates in 1979. Since then, Court has become one of the most respected Division III coaches in the country, having sent 42 athletes to the national championships with 11 earning All-America honors. In 1995, she was the New England Division III women's cross country Coach of the Year. She was a member of the NCAA Track and Field Rules Committee and served on the coaching staff for both the 1993 USA World Cup Track and Field Team and the U.S. Olympic Sports Festival. She worked as an intern in the USA Track and Field Office and helped with the administration of the NCAA Division I Cross Country and Indoor Track Championships. She is also active in youth track and field programs in the Lewiston/Auburn community.